You got a grain mill because you’re serious about your homebrewing. But could it be that you’ve never even thought about cleaning your grain mill? It’s not necessarily a health hazard if you’ve been chugging along for months, crushing up your grains, without a thought about what kinds of residue may be lurking there. But that nasty buildup won’t exactly make for ideal beer, either. And it’s not just a grain mill that gets a lot of use. Even a brand-new mill needs a thorough cleaning before you put that first batch of grains into it. Think about the dust and other microbes that could’ve accumulated in it while it sat on a warehouse shelf. They’re bugs, not features. Either way, learning how to clean your grain mill will help you produce a clean, consistent crush for every batch of homebrew. You’ll find a little bit of variety in the appearance of grain mills, but they all perform the same function in one of two ways. Grain is crushed between either a series of rollers or a pair of plates. The mill may be powered by you via hand crank, by an electric drill, or by its own motor. Some hand crank models can also be retrofitted with a motor. 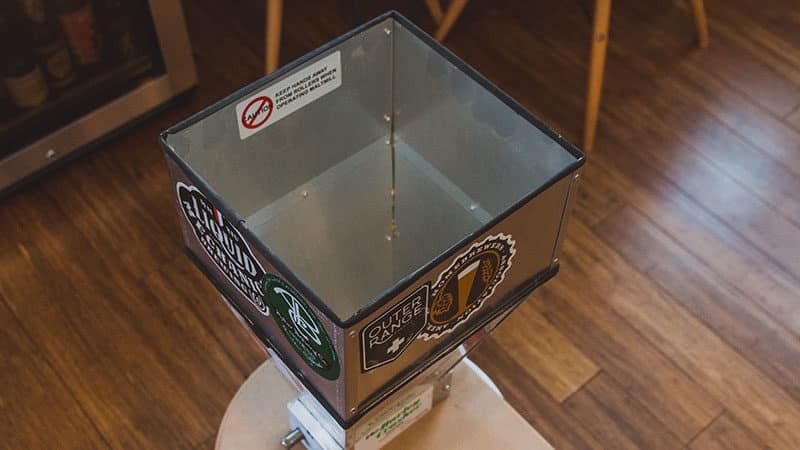 If you’re the type of homebrewer who only brews the occasional batch to enjoy at home, you may want to consider a roller grain mill If you click this link and make a purchase, we earn a commission at no additional cost to you. with a hand crank and a small hopper—say, six pounds. Choosing a model that can be upgraded with a motor gives you flexibility, so if you start brewing more often, or you decide to try all grain brewing, you’ll be able to process grain more quickly. Choose a sealed motor If you click this link and make a purchase, we earn a commission at no additional cost to you. so grain materials won’t get sucked into it and ignite. Really. If you have a lot of grain to crush, you can choose an industrial-style grain mill If you click this link and make a purchase, we earn a commission at no additional cost to you. with a 110-volt motor and large-capacity hopper. These big boys can handle upwards of 60 pounds of grains, allowing you to process your malts in batches, or maybe helping out your homebrew pals by crushing malts for them. Your brand-new grain mill might have arrived with a little lubrication in its parts. This is a good thing because it protects the moving parts from developing rust due to humidity encountered during storage and transit. However, you don’t really want that lube making its way into your homebrew, right? Rid your grain mill of excess oil quickly and easily by running a batch of rice (or grain you don’t mind throwing away) through your mill. When you’re done with that, use compressed air to blast away any rice debris left behind. You don’t want that in your beer either. 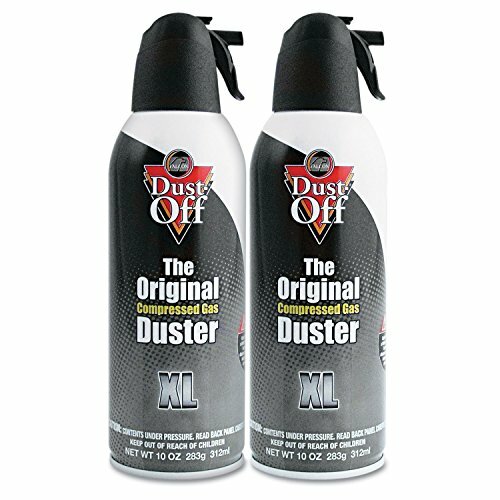 You can use the compressed air in a can If you click this link and make a purchase, we earn a commission at no additional cost to you. 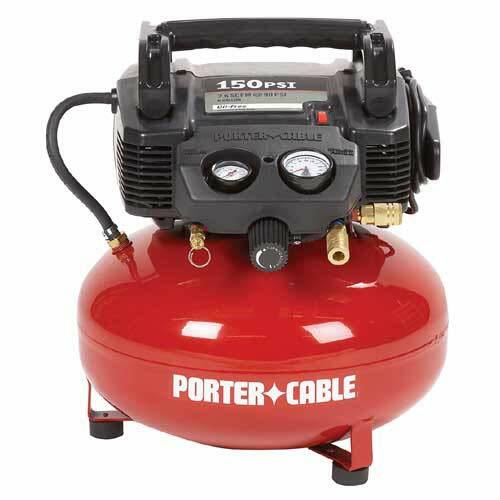 , like you would use on electronics, or the air compressor If you click this link and make a purchase, we earn a commission at no additional cost to you. in your garage, if you have one. Important: Before you start blowing away the dust left behind after a crush, we highly recommend you put on a pair of safety goggles If you click this link and make a purchase, we earn a commission at no additional cost to you. and a disposable dust mask If you click this link and make a purchase, we earn a commission at no additional cost to you. .
Well, someone might go 20 years without brushing their teeth, too, but we’re willing to bet you wouldn’t want to kiss them. Who wants to craft their homebrew using grains contaminated with mildew, mold, rust, or bacteria introduced by a filthy grain mill? Don’t be that person. Think of cleaning your grain mill just like tooth brushing—it’s preventive care. It’ll keep your malts clean, your beer tasty, and your machine working for a good, long time. You don’t need a huge assortment of specialty items, but you’ll want to keep a few basic supplies on hand for cleaning your grain mill. Safety goggles If you click this link and make a purchase, we earn a commission at no additional cost to you. Disposable dust mask If you click this link and make a purchase, we earn a commission at no additional cost to you. 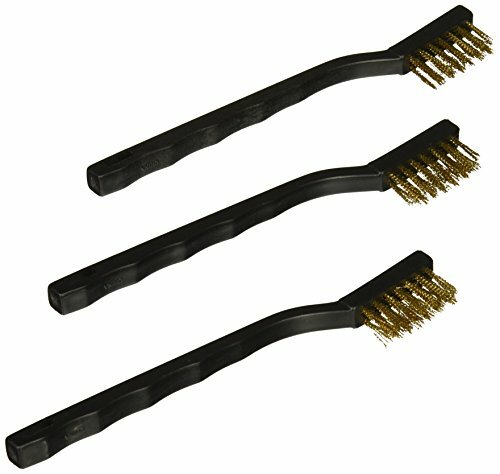 Wire bristle brush If you click this link and make a purchase, we earn a commission at no additional cost to you. Compressed air, canned If you click this link and make a purchase, we earn a commission at no additional cost to you. or from a compressor If you click this link and make a purchase, we earn a commission at no additional cost to you. 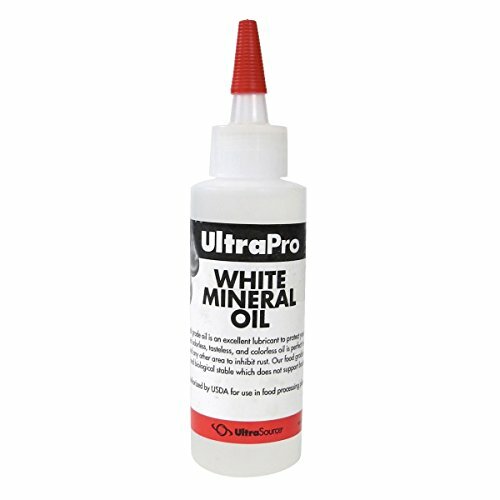 Food-grade mineral oil If you click this link and make a purchase, we earn a commission at no additional cost to you. Important: The U.S. Department of Agriculture (USDA) classifies specific types of mineral oil as safe for incidental contact with foods, meaning you won’t brew poisonous beer as long as you use food-grade mineral oil. After you’ve run a batch (or maybe a bunch of batches by now) of grain through your mill, it’ll be covered in dust. First things first—put on your safety goggles If you click this link and make a purchase, we earn a commission at no additional cost to you. and dust mask If you click this link and make a purchase, we earn a commission at no additional cost to you. . Things are going to get a little messy. Unplug the grain mill if you have a motor-driven model. No one wants to get zapped or crush a digit. Wipe away any dust on the outside of your mill using a dry lint-free cloth If you click this link and make a purchase, we earn a commission at no additional cost to you. . Remove the hopper and the plates around your rollers using your screwdriver If you click this link and make a purchase, we earn a commission at no additional cost to you. . Remove any clumps of grain from the rollers using a wire bristle brush If you click this link and make a purchase, we earn a commission at no additional cost to you. .
Blow away any remaining dust with compressed air If you click this link and make a purchase, we earn a commission at no additional cost to you. . If you’re short on time, you can blast a bit of compressed air down into the rollers while turning them. This won’t replace an actual cleaning, but it will get a good bit of the dust out when you’re in a pinch. Every so often, you really do need to give your grain mill a thorough cleaning. How often you need to do this will depend on how much you use your mill. If you notice any clumps or if your mill is struggling to turn, a deep cleaning is overdue. Once you get every last bit of residue out, oil it to help keep the mechanical parts moving smoothly. Unplug the grain mill if you have a motor-driven model. Wipe down the exterior with a clean, dry, lint-free cloth If you click this link and make a purchase, we earn a commission at no additional cost to you. .
Use the wire bristle brush If you click this link and make a purchase, we earn a commission at no additional cost to you. to clear any sticky debris from the rollers. Wipe all interior parts down with a second dry cloth. You don’t want to transfer exterior dust and debris to the interior. Why not wash this baby down with some brewing sanitizer and a few quick blasts from the hose? One word: rust. Make sure you keep your grain mill dry at all times so the rollers won’t develop rust and become difficult to turn. Not to mention, rust could flake off into your grain, and make its way into your beer. Yuck. Speaking of moisture, remember humidity in the air can also cause rust to form on metal surfaces over time. 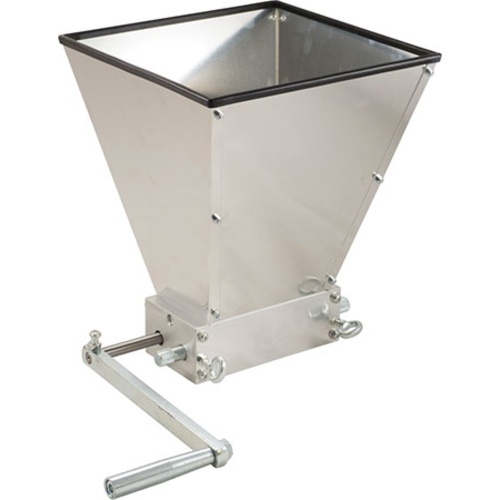 To protect your grain mill’s moving parts from humidity and oxidation, lubricate the roller bushing assembly If you click this link and make a purchase, we earn a commission at no additional cost to you. with food-grade mineral oil. It’s easiest to reach the bushings while you have your grain mill disassembled for cleaning. Apply just a few drops of oil to the bushing and the metal at the end of each roller. 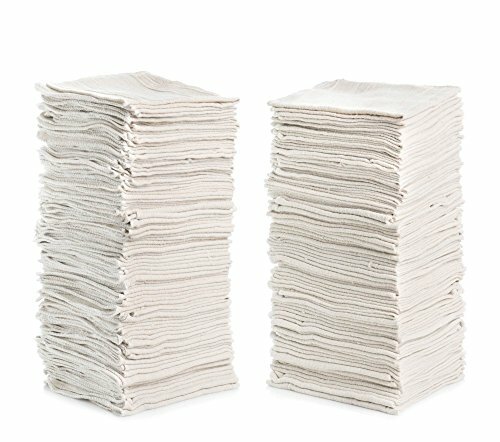 To keep mineral oil from soaking into your next batch of malt, wipe any excess away with a clean, dry, lint-free cloth. Use just enough to protect the machine without turning it into a slippery, greasy mess. Some grain mill rollers If you click this link and make a purchase, we earn a commission at no additional cost to you. are knurled to sit at (what the manufacturer considers to be) the optimal distance for an optimal crush. But most grain mill rollers can be adjusted to make the gap between them a little narrower or wider. You may decide to adjust the rollers if the grain isn’t crushed to the consistency you want, you’re finding a lot of whole grains in your bucket, or you suspect your rollers have shifted with use. Try to hit a sweet spot with the width of your roller gap. It doesn’t just affect the texture of your crushed grains, but will also affect the lautering process and your yield (efficiency). The smaller the gap, the finer consistency the crushed grains will be. With a larger gap, you’ll have more nearly-whole grains. And that kind of defeats the purpose of using a grain mill, right? It’s easiest to adjust the rollers right after a deep cleaning. Oil the rollers with food-grade mineral oil, reassemble the grain mill, then adjust them according to the consistency you’re aiming for. To adjust the gap properly, use a feeler gauge. Extend the gauge blade for the width you desire, then insert it between the rollers. The rollers should pinch the gauge firmly, but not so tightly that you can’t remove it. Use the feeler gauge to measure multiple spots across the length of the rollers to ensure an even gap. 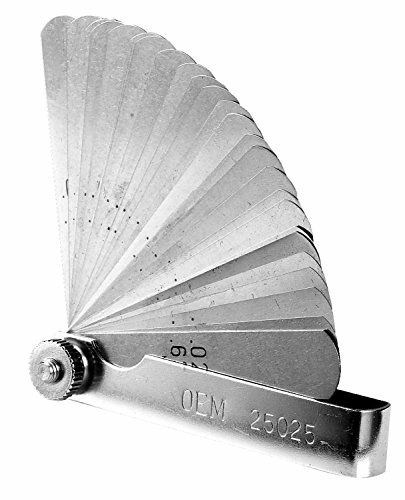 If you don’t have a feeler gauge If you click this link and make a purchase, we earn a commission at no additional cost to you. handy, you can also use a credit card. But maybe use the end without the chip, just in case. Properly cleaning and maintaining your grain mill isn’t a time-consuming or expensive endeavor. It’s really just about giving your machine a little TLC so it can perform at its best. Evenly milled, clean grains will help you brew your best beer. Although it’s tempting to just clean your grain mill with a quick blast of air after every few uses, preventive care can go a long way toward ensuring a long, happy life for your mill. And maybe even for you—but we can’t make any promises about that.